Posted in Status on March 31, 2017 by erik.rasmussen@noaa.gov. I found a few spare minutes to sneak in a blog post! This one is a bit long-winded, but it’s three days worth, and I’m not very good as a sound bite chef. It’s hard to describe what VORTEX-SE has been through in the last three days. In my last post, on Tuesday morning, the researchers had jointly decided that there would be a Gulf Coast convective system on Thursday that had a good chance of spewing chilled/dried air across the domain, and reducing or eliminating tornado chances. So the researchers from outside of AL all headed back home. By the time I got to my car in the parking lot at OKC, conditions appeared dire enough that I was told I really needed to get back to Alabama. No time to grab a rental car, and not trusting the airlines to ensure my arrival, I headed east in my own car on I-40, making it to Memphis in the late evening. We had a conference with the researchers at 8 PM, I squeezed in a badly needed load of laundry at the hotel, slept about six hours, and then got back on the road early in the morning with one more parking-lot stop to participate in another planning conference call. You can probably guess the next part of the story. The forecast had once again become dismal, with the likelihood that the coastal convective system would, indeed, flood the area with air that could not support severe storms. We worked through every imaginable scenario for supercells, but could not come up with any that had a good probability of occurring. So instead, we deployed the network of instruments on Sand Mountain, east of Huntsville, to study how that terrain feature modifies the low-level winds and thermal energy in ways that could promote tornadoes, holding out a slim hope that Sand Mountain might actually experience significant storms. The last few forecast model runs have trended toward a more potent scenario for Alabama for Monday. So, we have scheduled our next IOP for Monday. Most teams are making travel arrangements today, and will have until a 10 AM meeting tomorrow to confirm or cancel these plans. These are the sorts of issues that we face in our tornado research in VORTEX-SE. The whole research team, and the Scientific Steering Committee of the project, have been doing a lot of thinking and revising of plans over the last 6-9 months. We will try to reorient our efforts toward observing those things that we can consistently observe over longer periods of time, rather than trying to capture tornadic storms. We think we can make much bigger, faster progress in the science by looking harder at the environments of all storms in this part of the country, especially those features that span the sizes of 1-100 km (single town to several counties in size), in the lowest 3000 ft. Tornadoes in the Southeast are hard to predict, hard to “catch”, and even if we got lucky and had a tornado move through one of our deployments, it’s not obvious that we could fully understand the processes related to the tornado, and we sure could not say much generally about tornadoes based on one tornado. 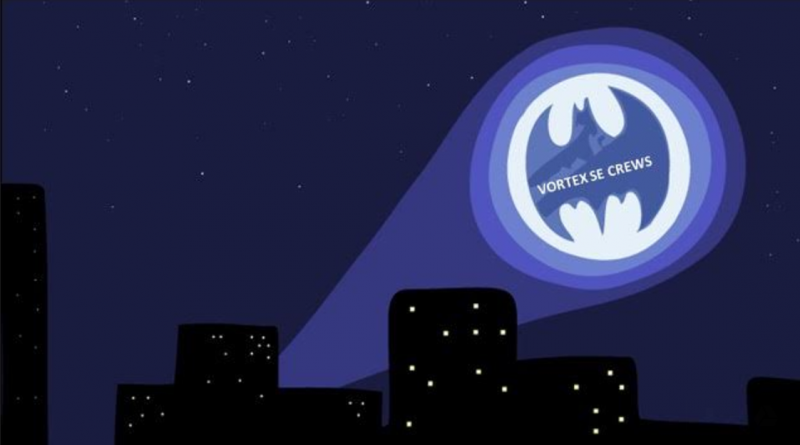 So as time goes on, I expect VORTEX-SE to continue to become more effective at producing new knowledge to improve the forecast/warning of Southeast tornadoes at all lead times, and I have great optimism that we will make big progress in understanding how information about tornadoes is conveyed to the public as well as how people and organizations respond to tornado information. All of this work will reduce the vulnerability to tornadoes in the Southeast. Posted in Status on March 28, 2017 by erik.rasmussen@noaa.gov. After meeting this morning, the researchers decided to not study the system that will pass through AL on Thursday evening. There were strong hints in several of our forecasting models that there would be a convective system closer to the Gulf Coast with this wave. In our experience, this tends to mean a loss of low-level moisture and heat in northern AL. The reasoning was that we now have some very good data sets on storms that appear to have tornado potential, but fail to produce. Now we need to skip these “marginal” cases when we can trust our own forecasts. The pattern remains active, with more systems likely to pass through the domain over the next couple of weeks. We are a bit worried about a possible increase in the strength of the subtropical jet stream over Mexico and the Gulf of Mexico. This jet often seems to be associated with coastal convection that depletes water vapor before it can move north in our domain. Just one more fly in the ointment of VORTEX-SE forecasting. The next system we will be watching is forecast to affect the Southeast around Monday or Tuesday next week. Yesterday, we had a very good day of observing. Over 80 soundings were launched from 12 teams, and combined with data from three profiling systems, we should have a detailed picture of the variations across northern AL that may have contributed to the storm behavior and organization. 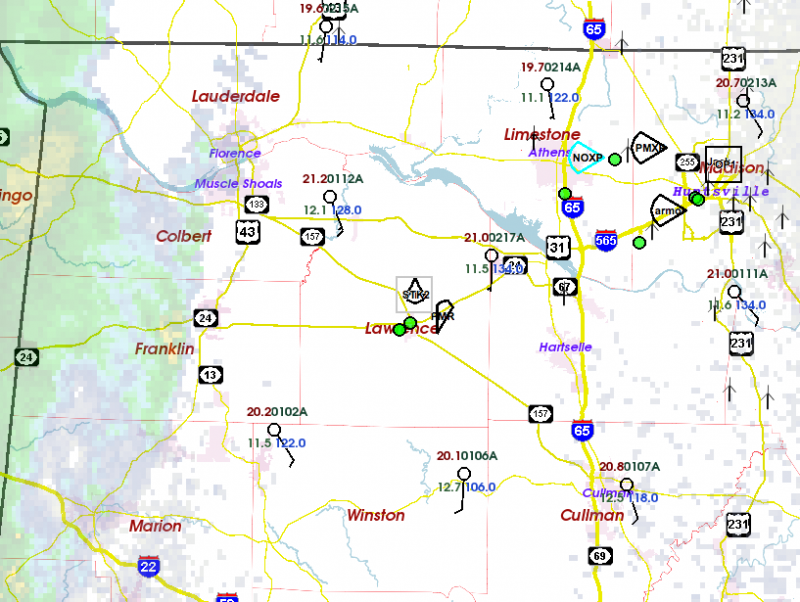 We also had a well-planned network of five Doppler radars in the area from Huntsville toward Florence. The NOAA P-3 was in the air from around 3 to 10 PM. Add to this the storm intercept teams from Texas Tech and Purdue, and we should have comprehensive data on the two systems we studied. The first was a band of storms, including a few supercells, that developed in far northwest Alabama in the mid-afternoon. For a short while, some of these rotated intensely enough aloft that they looked capable of being associated with tornadoes. After this round of storms passed through and out of the domain, a second quasi-linear convective system moved south into the domain from Tennessee. This second system was observed for several hours, and produced a couple of bow echoes and some reports of severe hail. Of course the researchers would prefer to study tornadic storms, but a case like this still is important to the research. We may be able to determine why the storms with rotation aloft didn’t seem to develop rotation very close to the ground. We should be able to study the various forms of storm organization and how these were related to variations in the storms’ environments. And the rich set of surface and upper air observations should provide important data to improve forecasting models, and tools that we use to analyze the airflow in the atmosphere using multiple Doppler radars. Posted in News on March 27, 2017 by erik.rasmussen@noaa.gov. Those sideways ice cream cones are mobile radars. The balloon symbols are mobile sounding teams. In the eastern part of the domain you can see an aircraft symbol which is the NOAA P-3 hurricane hunter aircraft on the ground in HSV preparing for an afternoon mission. We still have no clear idea where/when storms will form. The numerical predictions paint a lot of scenarios, ranging from one to two rounds of storms, and just about anywhere across our domain. In general, conditions would support some rotating updrafts. This is a fairly classic Southeast tornado forecast problem, with a relatively “uncapped” airmass and a lack of clear low-level features (fronts, etc.) to focus the location of the storms. So we are collecting data that should help address this major problem. Posted in Status on March 26, 2017 by erik.rasmussen@noaa.gov. Yesterday’s mission was interesting. Although the forecast had looked favorable for Saturday tornadoes in northern AL for a number of days, when we started work yesterday morning, a couple of things had changed. First, the low level moisture was a bit skimpier than expected. And the band of storms that started in AR and LA on Friday evening were still alive in eastern MS. This band was no longer forecast to dissipate, which would have allowed redevelopment later in the day back to the west. So we had no choice but to quickly deploy, and hope the result provided some favorable data. Some of my colleagues think it’s unusual for an event to look so promising 1-6 days in advance, and then fizzle. I wonder how often this happens, and how often things look unfavorable but then atmospheric conditions end up supporting tornadoes. I also wonder if our desire to have storms to study biases us toward believing conditions are more favorable than they are. If we had been able to heat up for another six hours, and had six more hours of south winds to increase the low-level moisture, Saturday probably would have turned out differently. But it always seems to be some ingredient that fails, even when the forecast looks promising (yes… scientists are human, have biases, and are not perfectly objective!). Nevertheless… we had an interesting event that we can learn from. The band of showers developed one relatively intense cell, with a little lightning, to the southwest of our domain. Quickly, this cell developed some rotation. This more intense cell and its rotation persisted all the way across the domain and up into central TN. At one point, the rotation was tight enough that it appeared there was a tornado threat, but aside from some minor wind damage, no severe weather occurred. A wave in a convective line like this can be associated with tornadoes, so it will be interesting to look at this case that “almost made it”. Remember that VORTEX-SE is more concerned with all these very hard-to-forecast tornado scenarios than we are with the big, classic “Great Plains” supercells that are relatively easy to forecast. This morning, the researchers gathered at 8AM at the UAH SWIRLL facility to talk about the forecast. First, they decided that today has such low probabilities of storms that VORTEX-SE will not operate. Tomorrow has a lot of uncertainty. Some of the operational forecast models are showing supercells at the very northwest corner of AL in the late afternoon. One experimental model ensemble (an ensemble is a group of computer model forecasts where the starting conditions are changed a little from run to run… to mimic the uncertainty in our measurements of the atmospheric state) shows a band of supercells running generally north-south through AL, at various east-west positions. Any one of those forecast possibilities would provide us with an opportunity for research. So given this potential, the researchers decided that we must operate tomorrow. Yesterday also provided us with a lot of small issues to work on today, such as instrument and communication problems. This is the way things always go in these field programs… researchers have to solve problems on-the-fly. We don’t just assume we can go to the field and things will work perfectly every time. This evening, we will all meet again and start designing the plan for tomorrow’s observations, and then early tomorrow morning we will meet one more time to make sure the plan is the best we can come up with. Then… back to the field. Posted in Status on March 25, 2017 by erik.rasmussen@noaa.gov. We just collected data on a nice little wave in a line of weak storms. It persisted all the way across our domain, over a period of a couple of hours. As it neared the north side of the domain, the associated rotation developed decent shear (change in Doppler velocity across the circulation). As far as I can tell, we had an excellent deployment of sticknets (surface weather instruments) and disdrometers (to measure raindrop size). These two measurements are related in purpose… the raindrop size and count is related to the coolness of the storm outflow, which seems to be related to tornado potential. The storm also moved through our radar array, and it seems that the data collection was good. This case may be interesting because it seemed to be on the borderline between non-tornadic and weakly tornadic. Sometimes borderline cases are the most useful because they add information about the thresholds of things like CAPE and shear that can be used to predict tornadic versus non-tornadic. We are in the field for the first IOP. Right now, the tornado potential is much lower than what the numerical forecasts suggested the last few days. CAPE is near zero, and we’re not sure how much it will grow over the next few hours. Shear is also less than expected. But we have a nearly full suite of instruments in the field beginning observations. A very weak line of convection is edging into AL from MS. Some guidance still suggests this will intensify early this afternoon with a lower-end risk of rotating updrafts. Posted in Status on March 24, 2017 by erik.rasmussen@noaa.gov. The researchers have arrived in Huntsville for the upcoming observing work. This morning, all of the high-resolution forecast models are showing a band of storms moving into AL tomorrow. The forecasts vary from a midday passage near Huntsville to an after-dark passage. The uncertainty is huge. Uncertainty here in AL is normally larger than anything I have experienced in the Plains, but this case is one of the most uncertain I remember. One thing that looks more certain is storm rotation. CAPE and the wind profiles look supportive of rotating storms, with the wind shear in the lower atmosphere possibly supportive of a tornado threat. So… the researchers will meet at 8PM tonight to see if we have a better picture of what will happen tomorrow. And likely we will meet one more time at 8 AM tomorrow to finalize our “plan-of-the-day”. Because of the uncertainty, the nighttime mission of the NOAA P-3 “hurricane hunter” aircraft has been cancelled. There was no way to fly tonight, rest the crew, and take off again at a reasonable time tomorrow. Instead, the flight is now scheduled to begin at 11 AM tomorrow, and finish by 11 PM. Here’s a cool set of pictures from our recent media day. Posted in Status on March 23, 2017 by erik.rasmussen@noaa.gov. Researchers are on their way to Huntsville AL for the first IOP. Forecast models are still portraying the overall scenario of the last few days. A significant wave will pass through AL Saturday and Saturday night. It looks like there will probably be a QLCS on Saturday night, and shear and CAPE look sufficient for there to be tornado potential. Around here, CAPE > 0 is of concern; this system looks like it will have CAPE around 500 J/kg, possibly approach 1000 J/kg during the afternoon. We are also watching for the risk of a few storms, perhaps with tornado potential, ahead of the QLCS. With the typical very weak cap in the low-levels, any lifting could get things going, and this is usually not forecast well by any of the current models. This forecast process has been fairly consistent with what we experienced last year. The large waves that set up the conditions for tornadoes in the Southeast are reasonably well forecast in the global models. The forecasted position, timing, and intensity fluctuates from day-to-day, but we’ve had pretty good luck deciding when to convene an IOP. The details of when and where convection will form are very hard to pin down, and forecasting the likelihood of a tornado in time to let teams put instruments ahead of the storm is harder still. It now looks like another wave will affect the region late Monday, with a return of conditions possibly supportive of tornadic storms. Thereafter, it seems that the parade of waves might continue a bit longer. Tomorrow the NOAA P-3 aircraft will conduct a solo mission to try to obtain Doppler radar data on the storms that occur in AR and LA. On Saturday, they will fly again looking at the storms over our northern AL domain. I will be busy with planning and operations tomorrow, and especially Saturday, so I may not be able to squeeze in blogging. Posted in Status on March 22, 2017 by erik.rasmussen@noaa.gov. VORTEX-SE will be conducting its first IOP beginning Saturday, 25 March. 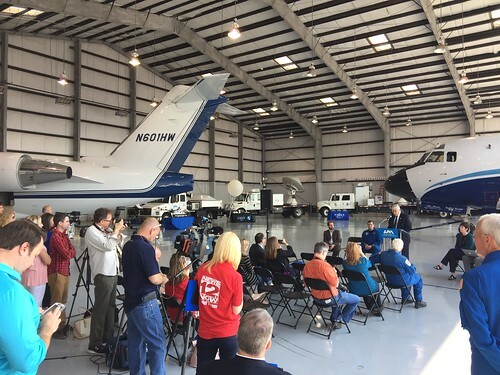 Researchers will be traveling to Huntsville AL and meeting on Friday evening to plan the Saturday activities based on the latest forecast guidance. We expect a wave to cross the region, increasing the shear substantially on Saturday. A band of convection is expected to move eastward into the domain out of Mississippi toward evening, but as we found last year, these details are hard to know more than 3-12 hours in advance. Right now, it appears CAPE will be sufficient for storms, and down in the range we often call “Low CAPE” (around 500 J/kg). Wind at about 1 km height is expected to be 40-50 kt, which is sufficient for low-level storm rotation. The NOAA P-3 aircraft will do a mission into LA/AR on Friday, and then will join the surface team observations on Saturday. I may be too busy to do the blog postings tomorrow and Friday, but will try to blog a time or two on Saturday. Posted in News on March 20, 2017 by erik.rasmussen@noaa.gov. Some of the researchers are gathering in Huntsville AL to participate in a Media Day tomorrow. It will be fun to share some of the complexities, goals, and challenges of VORTEX-SE. The Huntsville area is in SPC’s Slight Risk outlook tomorrow. This situation still looks marginal for any tornado activity, but hail and damaging wind looks more likely. Some of the researchers are going to check out their equipment, logistics, communications, etc. if storms move into the area tomorrow. We are still watching the weekend. Not much has changed in the forecast… it appears a strong upper wave and attendant cold front will move through the VORTEX-SE observing domain. The resultant weather depends, as always, on a lot of details that won’t become apparent until late in the week, and maybe not even until we do the analyses of our data with 20/20 hindsight. But as things stand now, an IOP is looking more likely every day. And by late in the week, we will possibly be dealing with the idea that this first IOP could possibly involve two or more episodes of potentially tornadic weather.